The only civil airport in Sanya is Phoenix International Airport. So far, there are over 45 airlines operating 160 or so air routes, including about 30 international routes. The number of the navigable cities and regions of this airport is about 100 now, with 30 or so located overseas. Sanya Phoenix International Airport is located in the northwest part of Sanya, 11 kilometers (9 miles) away from the city center. This airport has 2 terminal buildings, 2 minutes’ walk from each other. There are 3 shuttle bus lines and city bus lines connecting the airport with other parts of the city. There is also a high speed railway station next to the airport, where passengers can take high speed trains to reach other places on Hainan Island. How much does it cost to fly to Sanya from overseas destinations? The price fluctuation is very common in international air tickets. Averagely, the price of an economy class air ticket from London fluctuates between CNY 6,000 - 9,000, from Moscow fluctuates between CNY 3,500 - 6,000, from Vladivostok fluctuates between CNY 2,000 - 2,500, from Hong Kong fluctuates between CNY 1,000 - 2,000 and from Singapore fluctuates between CNY 600 - 1,500. For the real-time prices and the air ticket prices of other routes, passengers can use the search box on the page top. 1. 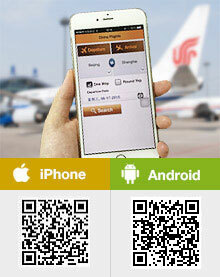 Normally, the tickets of flights to Haikou are cheaper than tickets of flights to Sanya. To save money, passengers can take a flight to Haikou first and then take a high speed train to Sanya. 2. Peak travelling season in Sanya is from November to next March, and the flight tickets are mostly sold at the full price; while in low season from April to October, the domestic flight tickets are normally sold with a 30% - 60% off discount. Passengers with limited travel budget are also recommended to avoid the public holiday, because the air ticket at that time are usually sold with very little discount or no discount. 3. Round-trip tickets usually enjoy greater discount than one-way tickets. Passengers with fixed itinerary can buy round-trip tickets. 4. The tickets of the flights departing or arriving late at night and early in the morning are usually cheaper than tickets of flights scheduled in other periods. Are there any direct flights from Shangri-La to Guangzhou and how much? Hi, there is no direct flights between the two cities and all the flights need to transfer in Chengdu, Chongqing or Kunming. The fare ranges form CN 800 to 2000 in different periods. Direct flights availabble between, you can check them by date online. Are there any direct flights to Sanya from Thailand, Cambodia, Vietnam or Myanmar? Thank you for your help! I know there are direct routes from Da Nang and Bangkok, seems not available every day but some days each week. Do you know what airline does that? From Bangkok to Sanya, Sichuan Airline has a flight. I am Malaysian. How to go to Sanya from Kuala Lumpur, Malaysia? take the direct flight from Kuala Lumpur to Sanya.